As the school year ends and many students head into summer vacation, the want to be outdoors and cooling off in the pool quickly becomes a need. With the love for outdoors increasing over the summer, remembering basic eye care and protection is crucial in the Las Vegas heat. Here are some simple tips to remember when preparing for some fun in the sun and a dip in the pool. Have some fun in the sun by…. 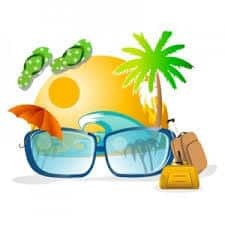 Wearing high UV sunglasses: Sunglasses with 400 UV Protection, which block almost 100% of the damaging light rays your eyes are exposed to, are ideal for proper eye protection during the summer. Make sure to check the label to be sure of their protection level. Avoiding colored tinted sunglasses:Avoid blue tinted sunglasses as they emit ultraviolet light, which is harmful to your eyes and should be blocked out as much as possible. Over exposure to such rays can cause serious eye damage. Wearing extra coverage:Hats provide extra protection than sunglasses alone. Many lenses leave a gap around the edges, below and above the eyes. Wearing hats provide extra coverage to stop the sun’s rays from shining on your eyes and exposing them to harm. Wear goggles: Goggles help protect your eyes from getting in contact with pool chemicals that can be harmful for your eyes. The one thing you want to make sure is that you are wearing the correct size, ones that fully cover your eyes without any gaps. Make your eyes feel comfortable: Whether it be with over-the-counter eye drops or prescription ones from your optometrist, make sure to place a few drops in each eye before and after swimming. After swimming, splash your eyes with water to rinse off any pool chemicals or dirt that may have been exposed to any part of your eyes. Just because the summer comes and goes, doesn’t mean you have to stop protecting your eyes. Follow these tips all year round or ask your optometrist for further recommendations.